My wife asked me for an LED lantern last night. This morning I thought to myself, “Wonder if Budget Light Forum has any ideas about what to buy?” Interested, interested, super interested. Please add me to the list. Welcome to BLF chathamh! How did you learn about the forum? Have you been lurking and just created an account for this lantern? I had a college roommate who was big into lasers, and to a lesser extent flashlights. He’s the one who informed me about BLF, and I’ve been lurking off and on ever since, yes. Definitely interested!! Glad I didn’t miss this one! Please add me to the list. Remember seeing this project when it started. I’m very impressed with the progress. Well, he didn’t say he was impressed with the ‘rate’ of progress. Remember, we’ve had prototype 1 to look at for quite a while, and the original design has definitely been ‘improved upon’ since then! Last I heard was that Lexel had been paid to design an all-singing and dancing driver that looks credible. With provision for tint-shifting, charging circuit, even hooks for powerbank and a load of other stuff, but not yet implemented. 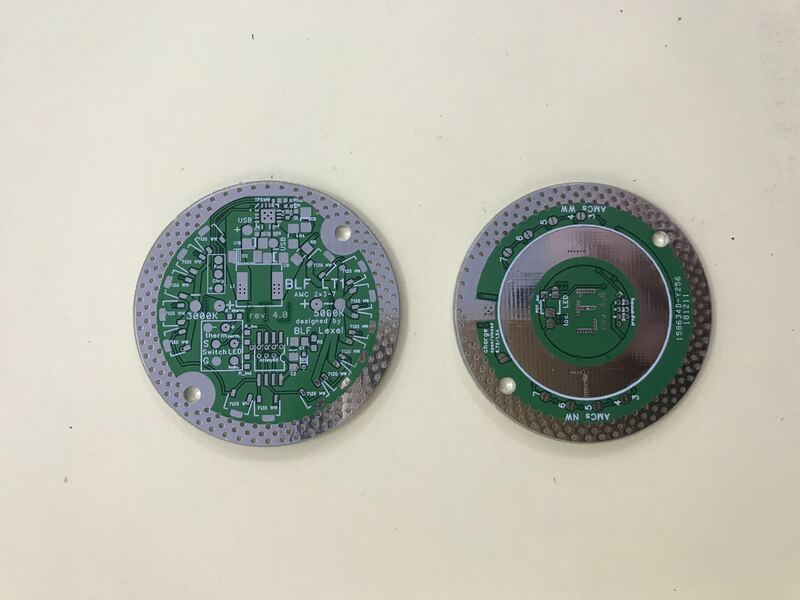 A photo of an actual PCB was given, presumably Barry is having some built up for prototypes at Sofirn/Thorfire. I think Toykeeper has roughed-out some initial firmware ideas to get it going. I think that the potential is there, but realistically there is a way to go yet. DBSAR has stated that real-life issues mean that he can’t give it his full attention at the moment, which I quite understand. But hopefully there is enough momentum for this to keep going now. I wish this project well, I think it has merit and great potential, and I would like to see it happen one day, and respect the people involved. Genuinely. Thanks for the updates and other info ….. and, btw….. well said. BLF LT1 prototype driver board awaiting test by Sofirn, delayed by chinese new year. Firmware is available. Driver has the charger circuitry, tint ramping. There is hope, but yes it there is still work to be done. Have not seen a MCPCB picture as of yet. Great news. Nice to see one assembled. Thanks. Looking good. It won’t be needing all those 7135s, but Lexel has provisioned for disconnecting them individually with solder-splash jumpers on the other side, to work out what works in this application. Plenty of development work still to do. Might even make a good efficient Q8 linear driver alternative for those who don’t require a FET as well. And want to add USB charging. CNY doesn’t start until February 5 by the way, that’s a month away. Hmm… 4.9A to 4x emitters? Not really great for a general purpose flashlight, although more than plenty for this lantern. Perhaps some of the long-term members that still know how to stack 3 or 4 chips high for more current. Well, the lantern is supposed to be using an absolute max power of 3×7135 per channel, so a max power output of 2.1A is doable without any throttling at all. 4,9A on the other hand would require thermal regulation. Back in the day people like MTN were cramming in loads of 7135s onto bespoke drivers for SRKs etc. This has got, I think, 16 total. 5.36 A. Which is plenty for a usable big Q8 sized 4 emitter torch, well heatsinked, that you just want to use indefinitely, rather than in short blasts with a DD FET. For this lantern, which was never intended to be a mega-blaster, the quantity is excessive. But it is there in the driver design, if wanted. Remember, it will only have two LEDs of each colour temperature. Total 4. To be modulated for tint-shifting. Averaging only two perhaps. With a questionable thermal path. And is supposed to be efficient and long-running and dependable at what it does. For many hours, or days even, providing useful illumination, even being recharged from a small solar panel between times (design aim, lets see how well the charging circuit manages that). Quite different from typical BLF pocket-rockets. It is supposed to last for many many hours. Draining over 5 A is not compatible with that, even with four good 18650 cells in the tube. That said, I would have a use for this driver in my Q8, in the real world, with suitable firmware. Two banks of 7135s connected in parallel through through the LED wires could work nicely. And if the charging input would also efficiently accept input from a small 12V solar panel (e.g. car battery maintainer), that would be icing on the cake. That was all part of the original concept. Has that all been forgotten ? Or what a lantern is for ? Maybe I’m the one who missed it, but IIRC, the driver design is limited to 7 chips per channel, total of 14, for 4.9A (unless the 380mA chips are used, then 5.32A would be possible). Several of the long-time members have done stacking in the past to get more, and they could presumably do that with this driver. But most of us current members wouldn’t. For this lantern, 7 chips per channel is much more than is needed. And the charger is limited to a low rate, despite many members wishing otherwise, because many solar chargers can’t handle too high a current load and will shut off, failing to charge anything at all. So yeah, that concept (using a solar charger for this light) is very much still there. The present PWB has two 7135s hard wired to drive the two banks of lights. 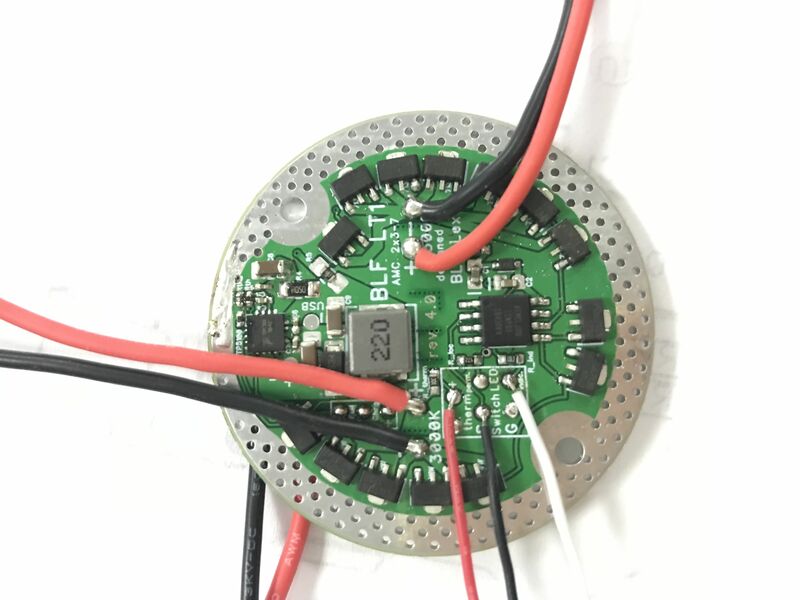 Up to 7 can be connected by applying a solder bridge to the pads on the battery contact side of the driver. Yes, if you do this then you will need to address thermal concerns also. The battery side also has programming pads, and some other bells and whistles I don’t recall presently. Thanks, I am wicked excited to see it so close!!!!!! When did it change from two channels of four? I haven’t seen anything where it changed from 4 × 5000K and 4 × 3000k (maybe 2700K). update: 2-channel MCPCB designed. Here is the basic design of the 2-channel MCPCB for the lantern for the 3000K ~ 5000K ( or 2700K ~ 5000K LED emitters) to work for the tint ramping. After some tests, i found that having the different color temp LED pads in-line with each other linear from the center post/tube, created the smoothest tint mixing beam pattern. 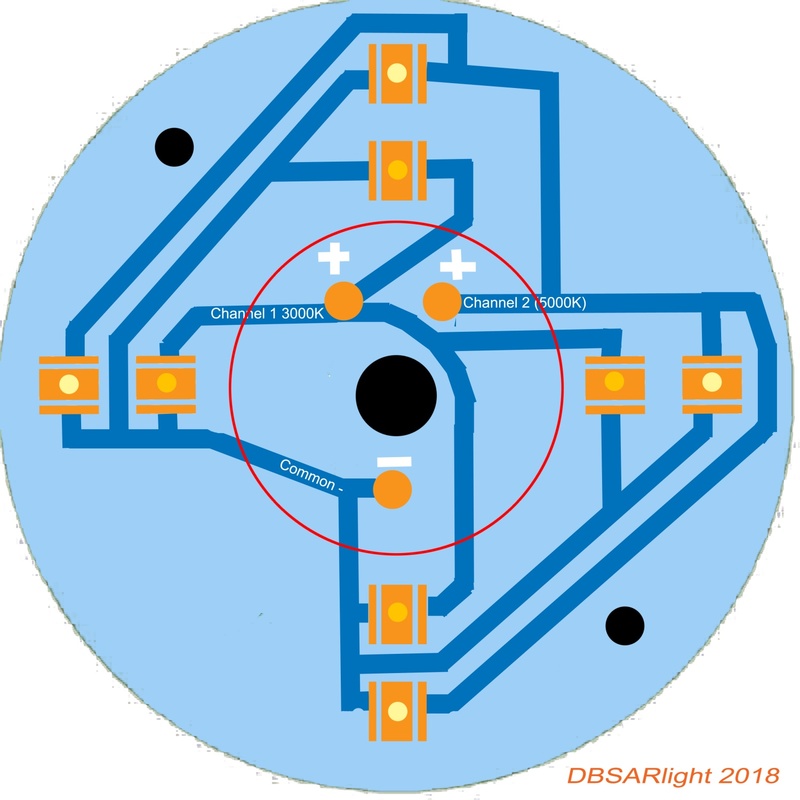 (*Red ring is the white center tube that covers the wires and the center bolt) two other black holes are for screws to mount the MCPCB to the lantern head. Yes, but it’s 2 channels of 4. Not 2 channels of 2. At least that’s what it was supposed to be. You can see the picture of the board in the OP, or click the img in my last post (not sure why it isn’t showing). It shows 2 channels of 4 LEDs, 8 in total. I’m interested in one or two. I am interested in one, two if possible. Definitely possible, you are on the interest list for two. Correct on that.. things have been very rough as of lately for me with life issues, financial issues, stresses, & preparations to sell my house and sell off a lot of things to move to a different province, but i still will make time to work on this lantern project here with the team here to do what i can to make it a reality as much as i possibly can.